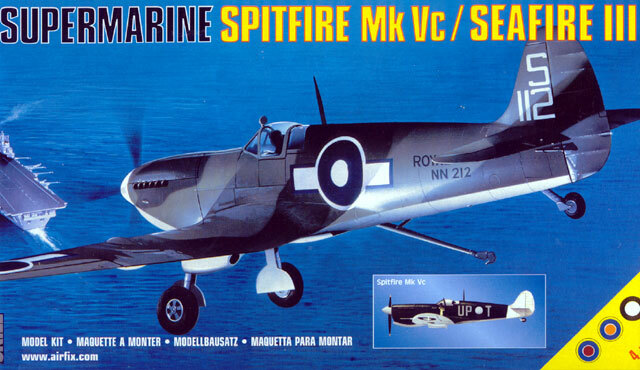 It's an old adage that you can't have too many Spitfires, but even the most ardent enthusiast must be surprised to see both Special Hobby and Classic Airframes both release new 1/48 scale kits of the Mk.VC almost simultaneously. In a tight race, Special Hobby got to the finishing line first, with a nicely presented model that is set to form the basis of a series of Spitfire and Seafire kits. The Mk. VC appeared in October 1941and was externally very similar to the Mk.VB. Internally, however, the wing was much stronger and was known as the so-called "universal" wing, which could house an armament of eight machine guns, two cannon and four machine guns, or four cannon. The cannon were supplied with double the ammunition of the Mk. VB. A further change was that the undercarriage was raked forward by 2 inches to improve ground stability. This is a limited-run kit, but moulding is very clean for model of this type. Many parts will need a little extra clean-up compared with a mainstream kit, but there's basically no flash evident and the only sink marks I could find on my kit are on the back of the spinner plate where they won't be seen. Ejector pin marks have been kept out of harm's way and don't interfere with assembly. The surface finish consists of very neatly engraved panel lines and embossed fasteners, with subtle fabric surfaces. Some areas, particularly the rear fuselage, have overlapped panels which might surprise anyone expecting the Spitfire to have a flush finish. Examining the Mk VB at Hendon last weekend, the overlapped panels look is correct. Some raised screws just in front of the cockpit are exaggerated, looking more like blisters. Dry fitting the main parts is encouraging. While the kit can't match "Tamigawa" precision, the main parts line up neatly enough. The joint at the wing root is fair, but I found the attachment tabs on the stabilizers needed trimming to fit. The rear fuselage features a separate lower panel to allow for future Seafires, while standard and tropical filter sections fit under the nose. Comparing the kit to other quarterscale Spitfires is interesting. While it's certainly not the easiest to build, I think ICM's Spitfire Mk. IX is generally held to be the most accurate mid-era Spitfire overall. Special Hobby's fuselage matches Tamiya's Mk. V very closely, being 1mm or so shorter behind the cockpit than ICM's and Aeroclub's aftermarket correction set. The rear fuselage matches Airfix's old Mk. V and more recent Mk. IX, but the nose is a mm or so shorter than the former. The wing chord follows ICM's and Airfix's, slightly less than Tamiya's and the wing top halves also don't have the odd little curved fillet that Tamiya added at the trailing edge - something not evident on the actual aircraft. The cockpit is nicely fitted out with a mix of styrene and etched parts. The moulded instrument panel has quite good raised detail and the seat features an etched harness and flares holder. Sidewall extensions are provided to avoid the hollow wing roots typical of most Spitfire kits, but a surprising omission is the prominent compass under the instrument panel. The wheel wells are deep and separate inserts depict the retraction mechanism, but the wells lack any interior wing structure. The mainwheel hubs are crisply moulded and the gear legs and covers are fine, while the etched fret provides towing rings. The propeller is the de Havilland type and appears nicely moulded. It's on a separate fret, so you can be certain a Rotol propeller is also planned for future releases. The canopy is moulded in three sections and is thin and free of distortion. The main section is bulged and the windscreen is the interior-armour type. The assembly diagrams are clearly drawn and the construction sequence is logical. Colours are keyed to Gunze Sangyo paints. There are full-page diagrams for the cannon arrangements for the four featured colour schemes along with placement guides for the comprehensive set of stencil decals provided. The "Malta Defenders" colour schemes provided are certainly eye-catching and could cause some controversy, because the exact details of the "blue" schemes worn by some aircraft are still a matter of debate. The decals are thin and glossy with perfect registration on my sheet. Carrier film is crystal clear and kept to a minimum. Along with the stencils, Special Hobby have included decals for the instrument panel fazes. Special Hobby have produced a fine kit that bodes well for future releases. It's a clear sign of the progress that the smaller Eastern European manufacturers are making because, while it certainly can't match the precision we've come to expect from "the majors", the gap is narrowing. It's all a far cry from the short-run kits of just a few years ago. Beginners should still get a few builds under their belt before tackling this, but modellers with some experience of mixed media kits can look forward to an enjoyable build. Special Hobby's Spitfire Mk. VC is available from Modelimex - specialists in Eastern European short run kits. Highs: Nicely moulded and detailed. Good quality decals for some very unusual paint schemes. Lows: Moulding limitations mean a little extra clean-up is required. A few missing details. Verdict: This is a very high quality limited-run kit that Spitfire enthusiasts will certainly want to add to their collections. Not a model for absolute beginners, but it promises to be an enjoyable build for anyone with a little experience.